This system is available in several different configurations ranging from 30m x 30m to 30m x 66m. 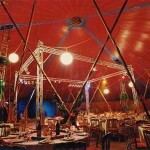 In addition to our round traditional circus showtent, we have designed, built and introduced new pyramid ends. These have delivered a radical improvement in audience sight-lines when an end stage is used. BUILD UP In favourable conditions, complete in 1 day. 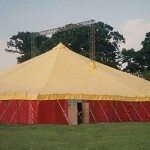 DESIGN This tent is a high profile modern Big Top, yellow on the outside and a dark maroon inside. It is a very striking and attractive tent, modern and elegant in appearance with a warm friendly interior. The use of a pair of goal post king poles gives excellent sight lines and the pyramid ends have four quarter poles only. 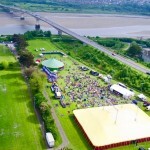 This very effective venue is an excellent choice for use with audiences of just under 2000 capacity for every type of event. RIGGING Two lattice work steel king poles with a small lattice steel cupola. The king poles are designed to take a load of up to half a tonne each for rigging lighting, sound and other equipment. SIDEWALLING 2.7m high, deep red outside, dark blue inside. 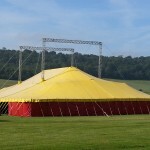 Traditional Circus Layout – ideal for aerial acts. BUILD UP In favourable conditions, complete in 1.5 days. 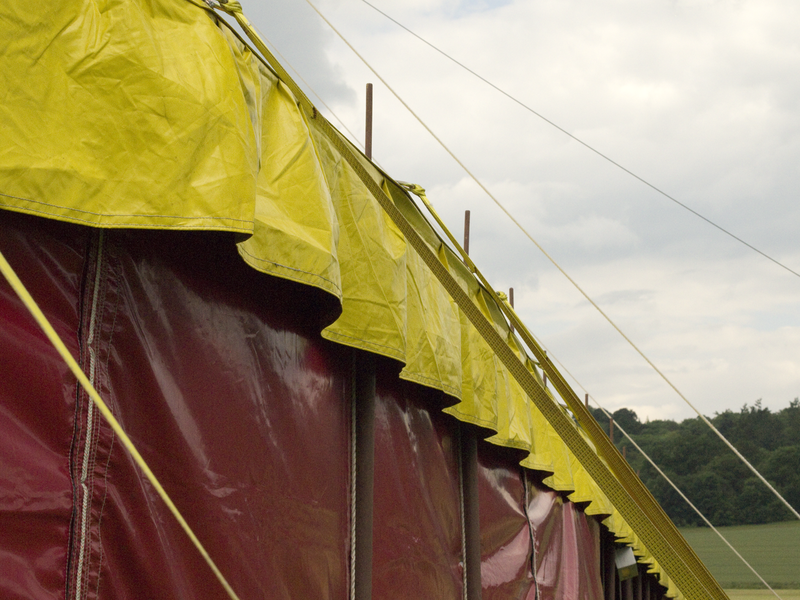 DESIGN This tent is a high profile modern Big Top, yellow on the outside and a dark maroon inside. It is a very striking and attractive tent, modern and elegant in appearance with a warm friendly interior. Its design facilitates lighting, sound and presentation. The pyramid ends have four quarter poles only. The use of a pair of king poles gives excellent sight lines and in the centres the use of quarter poles has been avoided giving an area 30m x 18m completely clear of obstructions, other than the king poles. 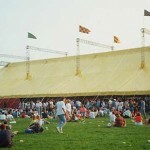 The photograph of a 30m x 86m tent shows how this works. RIGGING Four lattice work steel king poles with a lattice work steel cupola. The king poles are designed to take a load of up to half a tonne each for rigging lighting, sound and other equipment. STAGE This venue works very well with a side stage with excellent sight lines. The king poles are well placed to provide easy fixings for lighting and sound. This venue also works well with an end stage, when we can arrange to alter the quarter poles to allow a clear view of the the centre stage, and with goal post king poles, the sight lines are excellent. 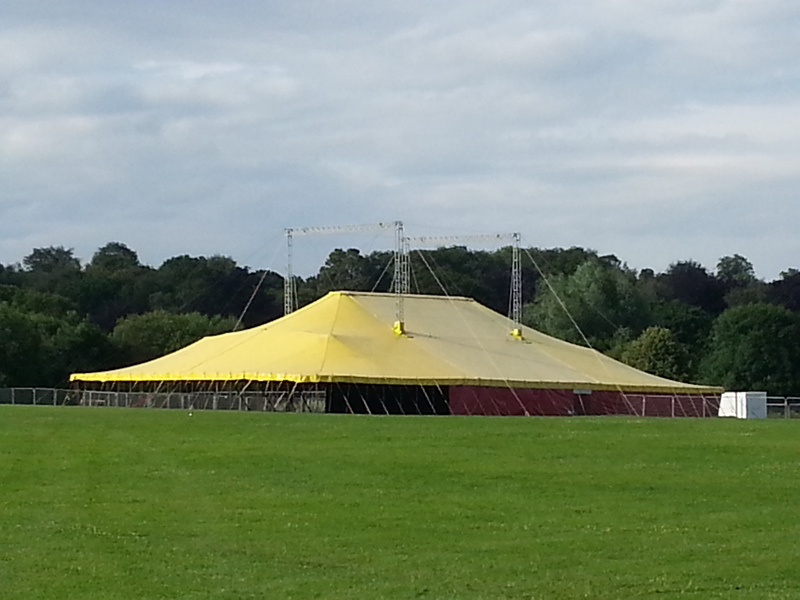 BUILD UP In favourable conditions, 1.5 days to get the venue up ready for other contractors to work inside. 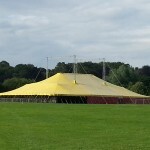 DESIGN This tent is a high profile modern Big Top, yellow on the outside and a dark maroon inside. It is a very striking and attractive tent, modern and elegant in appearance with a warm friendly interior. Its design facilitates good lighting, sound and presentation. The pyramid ends have four quarter poles only. The use of pairs of king poles in a goal post gives excellent sight lines and in the centres the use of quarter poles has been avoided giving an area of 30m x 40m completely clear of obstructions other than the king poles. 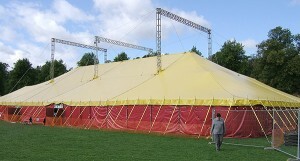 The photograph of a 30m x 86m tent shows how this works. STAGE This venue is best with an end stage, when we can arrange to alter the four end quarter poles to allow a clear view of the stage, and with the gol post king poles, the sight lines are excellent. A long venue with excellent sight lines and very little wasted space. The king poles make excellent positions for lighting. Screens can be hung from the long cupola. RIGGING Six lattice work steel king poles with two lattice work steel cupolas. The king poles are designed to take a load of up to half a tonne each for rigging lighting, sound and other equipment. DOORWAYS As many steel frame double doorways as required, 1.80m wide. BUILD UP In favourable conditions, 2.5 days to get the venue up ready for other contrators to start inside. 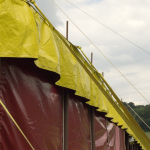 DESIGN This tent is a high profile modern Big Top, yellow on the outside and a dark maroon inside. It is a very striking and attractive tent, modern and elegant in appearance with a warm friendly interior. Its design facilitates good lighting, sound and presentation. The pyramid ends have four quarter poles only. The use of pairs of king poles in a goal post gives excellent sight lines and in the centres, the use of quarter poles has been avoided giving an area of 30m x 52m completely clear of obstructions other than the king poles. 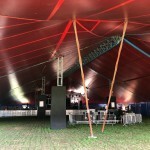 The photograph of a 30m x 86m tent shows how this works. RIGGING Eight lattice work steel king poles with three lattice work steel cupolas. The king poles are designed to take a load of up to half a tonne each for rigging lighting, sound and other equipment. BUILD UP In favourable conditions, 3.0 days to get the venue up ready for other contrators to start inside. 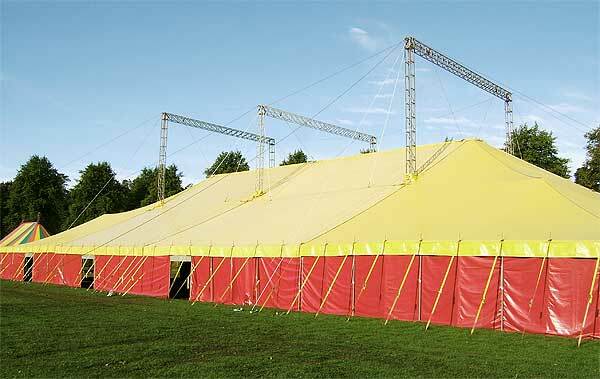 DESIGN This tent is a high profile modern Big Top, yellow on the outside and a dark maroon inside. 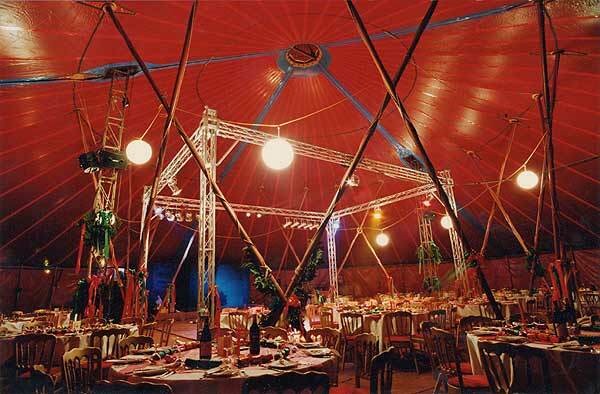 It is a very striking and attractive tent, modern and elegant in appearance with a warm friendly interior. Its design facilitates good lighting, sound and presentation. 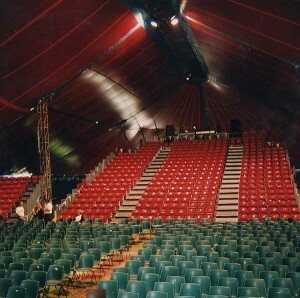 The round ends have quarter poles, which are designed with a flexible layout to enable stages, seating, lighting etc. to be placed in their optimum position. The use of pairs of king poles in a goal post gives excellent sight lines and in the centres, the use of quarter poles has been avoided giving an area of 30m x 65m completely clear of obstructions other than the king poles. 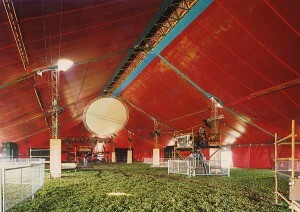 The photograph of a 30m x 86m tent shows how this works. RIGGING Teb lattice work steel king poles with four lattice work cupolas. The king poles are designed to take a load of up to half a tonne eac h for rigging, lighting, sound and other equipment. SIDEWALLING 2.7m high, Medium Blue. DOORWAYS As many as required – steel-frame double doorways, 1.80m wide.